​Shopping for a 15 gauge finish nail gun can be a little intimidating if you aren't entirely sure of what you are looking for. There are multiple styles, brands, and models that, at first glance, all look alike. But in reality, each type of finish nailer plays a very different role in carpentry. In this buying guide we will talk about what they are most useful for, what features to look for and give an overview of products to help you choose the best 15 gauge finish nailer for your project. What is a 15 gauge finish nail gun? Tips for how to use a finish nailer. How much should I pay for it? Let's take a look at five products to help you find the Best 15 gauge finish nailer. Nails Length: 1-¼ to 2-½"
Ideal for installing door and window casings, chair rails, staircases, molding, cabinets, and more. With this model, you can use 15-gauge nails that range from 1-¼ to 2-½ inches in length with a 34-degree angle. Because of this, it naturally fits into tight spaces and awkward angles. This nailer can accept 100 nails and is easy to load. The depth of drive dial is toolless and conveniently located underneath the gun’s no slip trigger. It can be adjusted according to the material you are nailing to get a professional finish every time. Another great feature is its 360-degree adjustable exhaust, which allows the user to direct the exhaust away from themselves, avoiding debris and dust while working. A simple flip of a switch on the NT65MA4 allows for either contact or sequential nailing with no other tools or parts required. The pre-installed air fitting is at an upward angle, which keeps the hose out of the way of both the user and the gun. The Makita AF635 boasts a magnesium body, aluminium magazine, and a powerful motor. It’s one of the most durable nailers on the market. Precision countersink nailing and a precision flush are easy with the Tool-less depth adjustment. It has a built-in air duster that is convenient for blowing debris and dust off your work surface, and a multi-directional port can be adjusted to blow exhaust air away from your face. The Makita accepts standard 34 degree15 gauge angled finish nails sized 1-1/4" to 2-½” long. This 15g finish nailer is compact and weighs only four pounds but is designed as a professional nail gun that can be used daily. This gun features a nail lock-out and large windows that will let you know when it’s time to reload. The trigger and contact arm are used together for firing. A reversible belt hook is part of the design. Nails Length: 1-1/4" to 2-1/2"
Battery voltage: 20 volts. Nominal 18 v.
DeWalt has created a great finish nailer 15 gauge that runs 100 percent on battery so you can forego the compressor. It’s the ideal tool for finish projects including crown molding, chair rails, shoe molding, cabinetry, or any fine finish work. It has a micro nose that improves your line of sight and increases the accuracy of the nail placement. A brushless motor maximizes its durability and runtime. Another feature is DeWalt’s 20V lithium-ion battery system, interchangeable with many other power tools in this line. This nailer is well-reviewed and versatile for both occasional home use or everyday professional use. Not as much power as a pneumatic gun. DeWalt’s nails are the only 100% suitable choice. The Bostitch BTFP72155 drives angle finish nails from 1-1/4 inch to 2-1/2 inches long. It features what Bostitch calls Smart Point Technology which means that the nailer has a smaller nose and offers easier nail placement than some of the other Bostitch nailers. You don’t have to compress the tip to actuate the gun, which results in less damage. This model, like the Hitachi, has a built-in air blower to clear away debris and dust, helping to keep your surface clean. This nailer features a mechanism that allows for tool-free jam releasing. Another great feature of this nail gun is its dial-a-depth control. You can use it to make sure your nails are sunk with precision. This model also offers a 16-inch on-centre gauge. It flips out and measures 16 inches from end to the nose which is ideal for installing wall trim. The selectable trigger allows for contact or sequential operation of the tool. It has a rear end exhaust and a 1/4-inch air fitting, and unlike the Hitachi, the Bostitch features an adjustable belt hook with a pencil sharpener. There is an improved visibility feature in this model that allows for integrated safeties that help you to see where you are driving your nail. The Senco 4G0001N with magnesium housing is lightweight at 4.5 pounds. It is comfortable for everyday use whether you are installing baseboard or door frames. It has an adjustable thumb wheel depth of drive and a 360-degree exhaust that is fully adjustable to keep dust and debris from blowing on you and your work. The Senco features never-lube technology, so there is no need to add oil to this model. It features and EZ-clear latch that allows you to clear jams quickly so you can move on to the work at hand. This nailer’s angle makes it easy to get a perfect finish even in tight corners. To change from sequential to bump firing, you just change the trigger. The Senco’s rugged design makes it a durable choice for professionals as well as hobbyists. 15 gauge nail guns can be electric powered, battery powered, or pneumatic, which means they run off compressed air powered by an air compressor. On the job site and at home, this tool can make life a lot easier by allowing you to set nails much quicker than with a hammer. This type of nail gun is commonly called a finish nailer, and 15 gauge nailer refers to the gauge of the nail that is used. The gauge measures its diameter. The higher the number, the thinner the nail is. This tool can also be used for trim work. However, 23 gauge pin nailers are generally better for this work. This allows you to switch easily from single fire mode, where you depress the trigger, or to bump firing mode, where the gun fires when you push on the nosepiece. If you are doing a lot of nailing, this is an essential feature to percent hand fatigue from depressing the trigger for long periods of time. Makes it easy to clear any jams that might happen. Jams happen in almost all nailers. One way to avoid them is to make sure you have the correct nails for your model, and also that you used oil when needed. Alternatively, don’t make the mistake of using oil in an oil-less nailer. Protects your work from the friction of the gun. Thumb activated blowers allow you to clear your workspace from dust and debris. This will automatically detect when there are no nails left in the magazine so that you don’t unnecessarily damage the wood. They are also known as pneumatic finish nailers because they operate on air supply. Most air compressors are powered by electricity, that means a pneumatic finish nailer can only be used where an electrical outlet is available. You have unlimited runtime as long as you’re connected to an air compressor, unlike cordless ones where you have to recharge batteries constantly. Although they are relatively cheap when compared with electric ones, you also need to consider the cost of an air compressor and general maintenance. They are of two types – compressed gas finish nailers and electric finish nailers. You get a fast nail repeat time with compressed gas finish nailers and you don’t have to wait for many seconds before it recharges. The operate on replaceable gas canisters which drives a nail when an electric charge ignites the gas. However, some people complain about the smell of the compressed gas. You have a longer run time than electric finish nailers as long as you replace the gas canisters periodically. Some manufacturers that use this technology are Hitachi and Paslode. Battery powered finish nailers are the second type of cordless finish nailers. Most of them are powered by a Lithium-ion battery which gives it a longer runtime although some manufacturers still use Ni-Cad batteries. The most obvious advantage of using a nail gun is that it saves the user time and effort. Instead of holding a nail and hammering it into the wood, the user can simply point and shoot. Additionally, the nails used in these guns are thinner, and the result is a more finished look. Another advantage of the thinner size is that wood is less likely to split than with a driven nail. The best drills for driving nails also are necessary to complement woodworking, though. Lastly, the hole that is left is quite easy to cover with wood filler, making the surface of your work smooth and professional looking. 15-Gauge finish nailers is a very versatile tool, they can fire nails up to 2-1/2 " long which can be driven through almost any type of wood including hardwoods, plywood and other manufactured wood products such as MDF. They are commonly used for installing door frames, baseboards, door and window casing, chair rails and other heavy-duty wood tasks. They also have the advantage of reaching into tighter spaces because they are collated at an angle inside the magazine. 23-gauge nailers can cause serious injury to a person not to talk of nails as large as 15-gauge nails. Ten of thousands of injuries are caused yearly by nail guns, so you can never be too safe when operating a finish nailer. Below are some tips to follow in order to ensure safety while operating your tool. Always use Personal Protective Equipment anytime you’re operating a finish nailer or any other nail gun. Also, don’t allow people to come near your work area without putting on these safety gears. Take little time to read your tool’s instruction manual after purchasing it. Reading the could be boring sometimes but as I said earlier, one cannot be too safe. Learning about your tool’s applications, limitations, and possible hazards will go a long way in preventing any potential injury. Never carry your finish nailer with your finger resting on the trigger, you could accidentally shoot yourself or anybody around. Most nail gun injuries occur as a result of people mistakenly firing nails into parts of their bodies especially the hands and the legs. Only press the trigger when you’re ready to fire. Always assume your finish nailer is loaded and don’t point the tool at yourself or anybody. What if there was a nail left in the clip? Finally, store your tool properly and out of reach of children or untrained persons. You don’t want your kids playing with a nail gun when you’re not at home. To keep your finish nailer in the best working condition, you have to carry out some maintenance periodically. Below are some maintenance tips to keep your tool in top working condition. Inspect your tool periodically for loose or damaged parts. Heavy vibrations tend to loosen some parts after extended use, you have to retighten them before using the tool. Also, replace any damaged or missing parts. Clean the external part of your finish nailer with a soft damp cloth to remove dirt, dust, oil, and grease. Don’t soak your tool in solvents, they can damage the plastic parts. Lubricate your finish nailer before each use especially the moving parts, to reduce the wear and tear that occurs as a result of friction. If you’re using a cordless finish nailer, always check the battery at least every few months to know its expiry date. Replace if it’s expired to avoid damaging the tool or potential injury. When clearing a nail jam, make sure you disconnect your finish nailer from the air compressor or remove the battery to avoid potential injury. Ensure your air compressor pressure is set within the tool’s acceptable limit if you’re using a pneumatic finish nailer. Use a finish nailer for intended use only. Using it on light wood trims will only split and damage the wood boards. Don’t hold the trigger too hard when firing nails because a brad nailer slightly recoils slightly when a nail is fired. Doing this will prevent the nailer’s nose from hitting the wood board in a way that will damage the tool. The prices of 15 finish nail guns vary but typically run between $80 to $300 or more. Obviously, some guns in the higher end range have more bells and whistles. As they are used to do more precise work, are generally more expensive than brad nailers 18 ga. 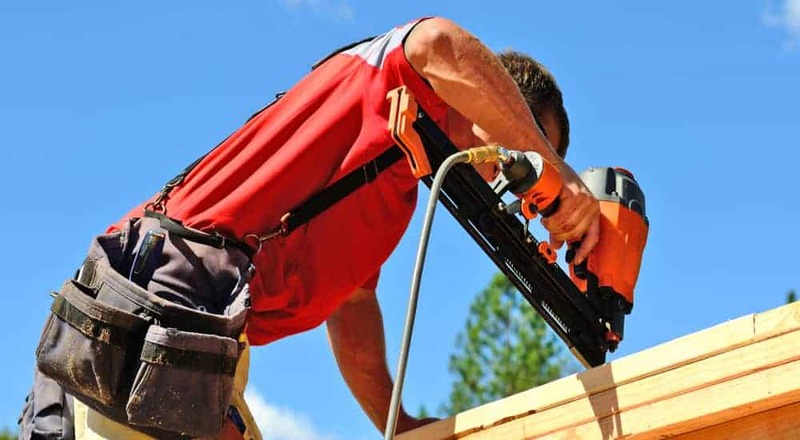 If you are a carpenter who’s livelihood is determined by your speed and performance, you will want to purchase the best nailer you can afford to get. If you are a hobbyist who will only be using it part time, things like ergonomics may not be as important as it would be for someone who has to hold the tool for several hours a day. In this case, a less-expensive model might suffice for you. It really comes down to personal taste. But no matter what you decide on, you want to make sure that it works for the job you need it for. •Do not point a nail gun at anyone, whether it’s loaded or unloaded. •Keep your fingers away from the tip when you are firing so you don’t accidentally puncture yourself. •If the gun jams, disconnect the compressor before you attempt to dislodge any nails. A: Gauges get bigger as the fastener gets smaller, so a 15-gauge nail is thicker than a 16-gauge. A 15-gauge nailer is more resistant to deformation and can go through hardwoods of large thickness. A 15-gauge finish nailer can be used only for extremely thick exterior trim, or thicker interior stock or else it will split and damage the wood. A: While a finish nailer can only accommodate up to 2 ½ inch nails, framing would require up to 3½ inch nails to join 2x4 boards together. A more suitable tool for this is a framing nailer. A: No, the longest brad nails are about 1½- inch long while the lowest a finish nailer can accommodate is 11/4 – inch long nails. If you can afford it, having both guns will make a great combination, you’ll use the finish nailer for heavy trim materials and the brad nailer for fine nailing tasks. A: Definitely! Perfect for the job. A: A finish nail is not really a good choice for siding installation. A siding nail will be the best for the job. A: Loading a 15-gauge nailer is as simple as loading your stapler. Ensure your trigger is not activated before loading and point the nose of the nailer away from your body. Slide the nail strips carefully into the magazine and push the magazine cover over the nails until it snaps into place. You can test by pointing the mouth of your nailer into a wood board and pressing the trigger. A: Angled finish nailers ensure you reach into the tightest space possible when nailing. A: Different gauge finish nailers are used for different purposes. Although 15-gauge nails are thicker and more resistant to deformation than 16-gauge nails. 16-gauge nailers are more versatile and can be used for both small and big projects.